I’ve enjoyed creating and sharing brain breaks and focused attention practices here over the past few years—practices that benefit every student as their brains prepare to learn. 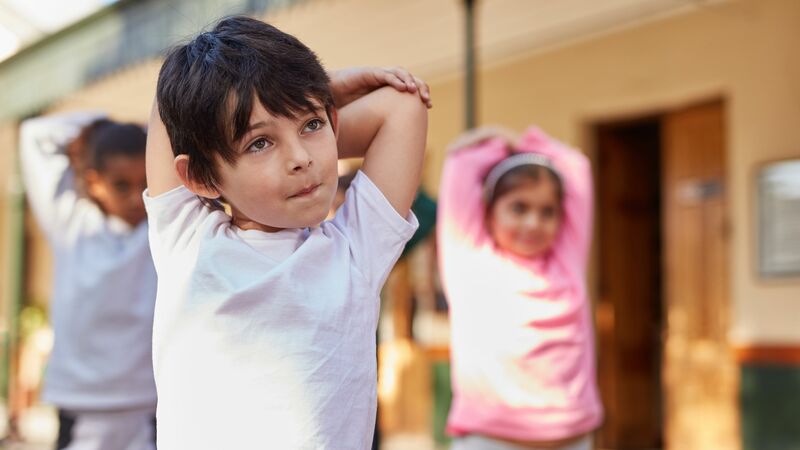 Brain breaks create a state of relaxed alertness, while focused attention practices help students slow down and focus on a stimulus, enhancing their executive functions of sustained attention and emotional regulation. These practices address discipline proactively, before any problems arise. I hope you and your students enjoy these activities as you prime the brain for attention and a state of relaxed alertness. These all work well with elementary students, and some can be used with older students as well. Peeling a tangerine: Give every student a tangerine. To begin, ask them to guess what they might be doing in the next couple of minutes before they eat the fruit. You can prompt them with a question such as: How is this tangerine like our brains? Next, ask them to hold the tangerine behind their backs—or just close their eyes—and peel it without looking. Can they peel it without splitting the fruit? Was this easy? Harder than they expected? How fast could they do it? As they eat the fruit, ask what sensations, feelings, or memories they experienced. Paired mirror drawings: Have students find a partner. Each student will take a pen or pencil and a sheet of paper, and sit facing the other. One student will lead and the other will follow: The leader starts drawing an image related to the class subject matter, and the follower copies the drawing and tries to guess what the drawing is supposed to represent. Have students switch roles, so the other person can lead. Once again, as the leader begins to draw, the follower should mimic the leader’s drawing and guess what the drawing is. Pouring water: Give each student two small paper cups, and fill one with water. Have students practice pouring the water back and forth from cup to cup, finding a rhythm in the pouring. After a few times, have students close their eyes and see if they can continue to gently and carefully pour the water back and forth without spilling too much of it. Give them 30 seconds for this, and then see who still has water in their cups. Breathing: Have students inhale deeply, lifting both arms in the air over their heads and holding their breath for four seconds. As they exhale, have them slowly place their hands on the back of their neck and massage their neck. They can repeat this three or four times until they feel more relaxed. Tracing a hand: Have students take a marker, crayon, or pen and trace their nondominant hand without lifting the pen as many times as they can until they begin to feel calmer. They should focus on their breathing during this activity. Swimming in the deep end: Have students lay on their bellies and move their arms and legs, breathing in and out five times; on the sixth breath, they should slowly relax their arms while still kicking their legs. On the seventh breath, they should stop kicking and lay still, imagining that the water is pulling them down or the clouds are pulling them up into the sky. Tell them to imagine they’re weightless and drifting or floating to their favorite place. They can imagine the colors and sounds as they breathe deeply for a minute. Melting an ice cube: Give each student a small ice cube to place in their mouth or hold in their hands. Ask them not to crunch or chew it but to notice how it slowly melts. They can imagine a worry or concern meting away with the ice chip, taking deep breaths until it has disappeared. Balancing tree: Have students place both feet solidly on the ground. They should slowly lift one foot and touch it to the inside of the other calf or upper leg, and raise their arms in the air over their head. Next have them wave their arms as if they were a tree with its branches blowing in the wind. Have them switch legs and repeat this motion. Next ask them to show a tree in a rainstorm and to notice how the trunk of the tree—their body—stays strong: Even though they might wobble, they’re still standing tall. Focusing on balance: Ask students to stand on one foot, holding the other foot off the ground and keeping their balance. With each breath, they should try to lift their foot higher. Have them pay attention to how high they can lift each foot. Not chewing gum: Give each student a piece of gum and have them hold it in their mouth for one minute without chewing, just feeling the sensation. Ask what they noticed as they tasted the gum but did not chew.